British grandmaster John Emms is an experienced chess coach who has trained many national junior champions. He has coached teams at the World and European Youth Chess Championships, and is a coach at the Kent Junior Chess Association, whose Under-9 team won the national championship in 2016 and 2017. Emms has played for England at two Chess Olympiads and captained the team at the 2002 Bled Olympiad. He has authored many books on all aspects of chess. “Starting a chess game with 1 e4 e5 is so common that the resulting complex of opening systems traditionally commands its own sobriquet, ‘The Open Games’. This includes famous openings such as the Italian Game, Ruy Lopez, Scotch Game and many others. The central structure with pawns on e4 and e5 often leads to play based around highly classical themes which are the bedrock of successful chess understanding. Playing 1 e4 e5 openings (as White or Black) is an excellent way for young players and improvers to develop their tactical knowledge and skills. There is also an index of variations, and an index of complete games. The openings covered in greater detail are the ones Emms recommends playing from either side. There are thirty complete games ranging from 1874 to 2016, featuring the likes of Fischer, Alekhine, Morphy, Chigorin, Botvinnik, Carlsen, along with British stalwarts Jones, Arkell, Adams, Nunn, and Flear. Almost half the complete games are miniatures; with twenty wins for white and ten for black. The diagrams are plentiful enough that one can follow along without use of a board. 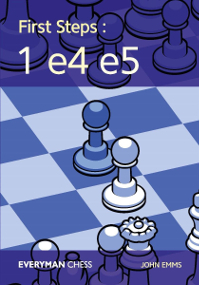 Emms considers First Steps: 1 e4 e5 as a follow-up to his earlier title Discovering Chess Openings. In the latter he focused on basic opening principles. Here he concentrates om “studying a range of openings and making choices about which ones to play in your games.” The text is interspersed with notes, tips, recommendations, exercises, points to remember, or interesting facts. Emms often presents a winning trap for White, only to then present the refutation as Black, and then again how White could proceed in a more intelligent manner than by playing for the trap, and again showing how Black would counter. These lessons about the cut and thrust ongoing over-the-board during the opening moves are immensely useful to deepen your understanding of the game. 1 e4 e5 2 Nf3 Nc6 3 Bc4 Bc5! Black’s bishop does the same as White’s and moves [to] an active square. Black wants to develop the kingside pieces as quickly as possible, to get ready to castle, but it’s much safer to move the bishop first. If White now tries 4 Ng5?, Black simply takes the knight with the queen! Did you know? The opening after 3…Bc5 is sometimes called the Giuoco Piano, which is Italian for ‘Quiet Game’. As we shall see, though, often this opening is anything but quiet! This pawn move frees the bishop on c1 and it also allows White to safely move the knight to g5. How does Black deal with the threat to the f7-pawn? Points-wise, bishop and knight for rook and pawn is a fair exchange, but Black enjoys the advantage in this position, for two reasons. 1) Black has many more pieces developed than White. 2) In the early stages of a game, two pieces are definitely worth more than a rook and pawn. Rooks normally take a long time to get into the game, and they only show their full power once the position opens up after some pawn exchanges. As Black, you may feel that your king has become a little exposed, but the fact that White has swapped off all his attacking pieces makes the black king perfectly safe. If you are really concerned, you could always move it back to g8 at some moment. 8 0-0 d6 9 Nc3 Bg4! An excellent move. Black develops the bishop and threatens the white queen. White is unable to block the attack with 10 f3, as that would be an illegal move! There’s no let-up – Black continues with forcing moves. The knight hops into a strong central square and creates a new threat of …Nxc2, which would fork the queen and rook. Note: The concept of a ‘forcing move’ is a very important one in chess tactics. It’s a move which gives the opponent very few choices in their reply. A forcing move is nearly always a check, a capture or a threat. Forcing moves should always be considered in your calculations. White has to move the queen again and block the bishop, which isn’t ideal. Black has a fantastic position, with many promising ideas here. One option is to play simply 12…Rf8, followed by …Kg8, when the rook comes to life along the half-open f-file and all of Black’s pieces attack on the kingside. In the game Black went for a quicker win, and got it! Very creative! If the bishop is captured by the pawn, Black’s knight hops into f3 and forks White’s king and queen. Black’s bishop move also creates a big threat, which White fails to spot. White’s only good defence was 13 Re3!, after which Black should play 13…Be6. Black sacrifices the bishop in order to blow open White’s king. This time it’s much more difficult for White to ignore the bishop, given that Black is threatening …Nf3+. 13…Qg4! is another very strong move, and soon leads to checkmate. 15 Kh1 puts up a better defence, but Black wins anyway after 15…Nf3! 16 Qe2 Qh3!. There’s no safe way for White to stop the threat of checkmate with …Qxh2. Black could have taken the queen on d2, but checkmate is stronger! 1) Bishop to c5, then knight to f6 – bishop first, then knight! This way of developing the kingside pieces prevents White from playing 4 Ng5. 2) Be prepared to meet the knight coming to g5 by castling kingside, which defends the f7-pawn in the most natural way. 3) The Ng5 attack is normally only a good idea if your opponent can’t defend the f7-pawn by castling. This is a fun and informative book. While some of the material is basic, with sections such as “How to Beat the Four-Move Checkmate,” much of it stresses the micro-principles that when adhered to lead to winning chess play. First Steps: 1 e4 e5 is more of an instructional manual about piece activity in the open games than an opening book, as such it is suitable for a broader range of players than its title suggests.